While the world fawns over the Apple Watch 3, serious runners and adventurers know an outdoor sports watch is a far better way of spending your money, and the Garmin Fenix 3 is one of the firm's most ambitious efforts yet. Following on from 2014's Garmin Fenix 2, the Fenix 3 brought with it a new color screen, more activity modes and faster GPS locking. You get a limited number of smartphone notifications, if you want them, but the emphasis is on tracking your vital statistics as you journey through the great outdoors (or work out inside). It launched for the hefty sum of £369 ($499, AU$650) with a grey or silver strap, but has since dropped to £299 in the UK. For £449 ($599, AU$849) you could pick up a premium Fenix 3 Sapphire edition with extra-tough glass on the face (hence the name) and an additional metal strap, although that's now down to around £375 if you opt for the model with integrated heart rate monitor (which launched later). Since the Fenix 3 first launched, we've seen the Garmin Fenix 5 range and then the Fenix 5 Plus range that expands on the series even further. That's meant the price of the Fenix 3 has dropped too, but it's still quite an expensive product considering it's three years old. As we've mentioned, the screen is one of the main upgrades over the Fenix 2, and the 3.1cm (1.2-inch) 218 pixel-diameter display uses a colour system Garmin calls Chroma. It's backlit and is easy to read in sunlight, assuming it's actively tracking something like a hike or a run. Waterproof rating has doubled too, from 50 metres to 100. If the screen's in its monochrome power-saving mode it can be tricky to look at inside or out. Nevertheless, buttons and menus are clear and straightforward, and what little space there is on the screen (compared to a smartphone at least) is used well. The rubber strap supplied with the Fenix 3 is sturdy without being uncomfortable, and even after a long run, soaked with sweat and rain, it won't bother you to any great degree. It's a strap that feels like it'll take a lot to come loose from your wrist - basically, you don't have to worry about it. The more expensive Sapphire edition is obviously for wearing at evening soirees rather than out on the hills - not only is the metal strap less comfortable to wear, it substantially adds to the watch's weight too. Battery life is impressive: with GPS, Bluetooth and the screen enabled on during run tracking, I only saw drops of 6-7 percent an hour. That means even if you're actively using the watch non-stop (and you won't be) you should be good for 15 hours or so. 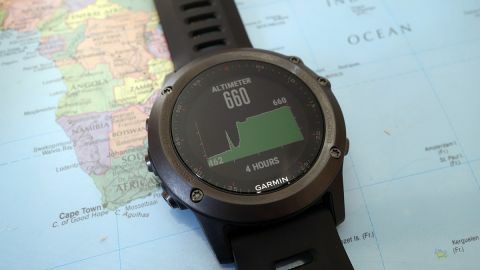 Garmin says the battery life with GPS active is 16 hours, so that just about matches up. You can stretch that to 50 hours with a low-power UltraTrac mode that pings for a GPS location every minute rather than every second. In standby, watch-only mode, meanwhile, Garmin says the Fenix 3 will go for three months, and I can well believe it: it only drops a percentage point or two each day if you're using it solely for telling the time.